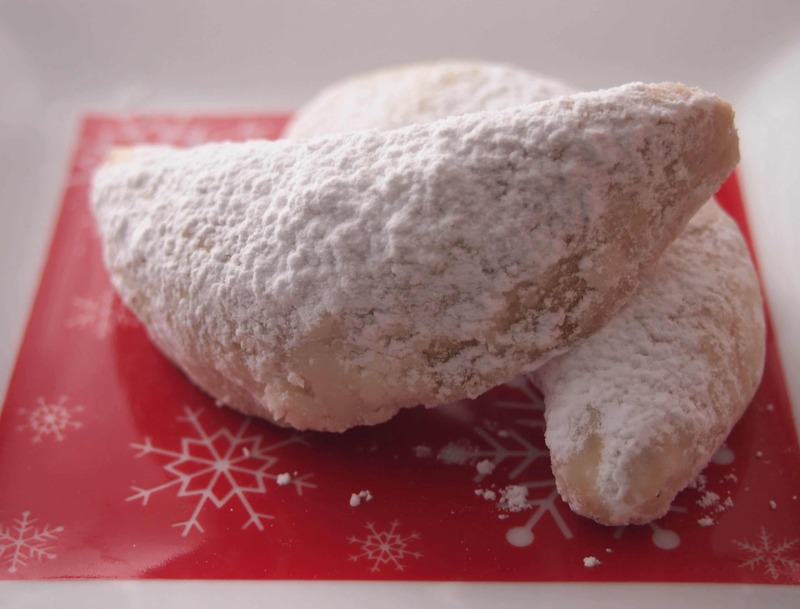 A holiday cookie classic, these Hazelnut and Almond Crescent cookies rolled in confectioners’ sugar just melt in your mouth. This is definitely a special occasions type of sweet. Crescents are a holiday classic for many and they are one of my family’s favorites. They are rich and buttery, delicious on their own or served with a good cup of tea or coffee. This particular recipe combines freshly toasted and ground almonds and hazelnuts. But you can use just about any nut or nut combination you fancy. If you prefer you can also roll the dough into balls instead of shaping into crescents. You can roll them into the powdered sugar once you have finished baking them. These cookies freeze really well, just store them in an airtight container with wax paper in between the layers of cookies. Remove them from the freezer a few hours before serving. 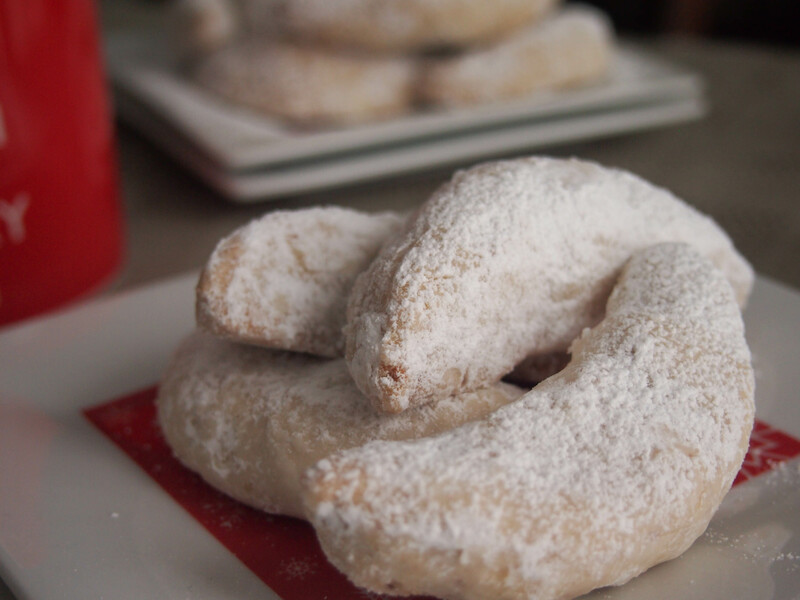 If desired, you can sift a little more powdered sugar on the crescents before serving them. To toast nuts, preheat oven to 325°F. Spread each variety of nut on a separate cookie sheet and in a single layer. Make sure to stir the nuts every few minutes. Nuts are done when they’re lightly browned, it should take between 8 to 10 minutes. In a food processor, process the sugar and salt until it looks powdery and finer, about 45 seconds. Add the almonds and process until they’re finely chopped, about 20 seconds. Add the hazelnuts to the almonds and process until they are medium-fine chopped. Add the butter and the vanilla and almond extracts. Pulse until the butter is smooth, scraping the sides of the bowl a few times. Add the flour in two additions and pulse until incorporated and a soft dough begins to form around the blade. Transfer the dough to a large bowl and mix briefly with a rubber spatula to be sure it’s evenly mixed. Chill the dough for an hour. To shape dough into crescents, use a cookie scoop to measure equal amounts of dough for cookies (I use a number 50 scoop). Shape each ball into a crescent and arrange cookies 1 inch apart onto baking sheets lined with non stick mats. Refrigerate the cookies until they are ready to go in the oven. Bake crescents, one sheet at a time, for 17-18 minutes, rotating the sheet from front to back halfway through baking. Cookies are baked when bottoms are golden and tops are slightly coloured and firm to the touch.